The grid shows the prices and daily availability from Sun 21 Apr 19 to Sat 27 Apr 19. It's easy to check availability for particular dates; just use the calendar to choose the check in date, select the number of nights and click the 'Search' button. Click the Book or Reserve button to book the highlighted days. With Book the room booking will be confirmed immediately, with Reserve the room reservation will be confirmed within 24 hours.. Privately owned guest house. 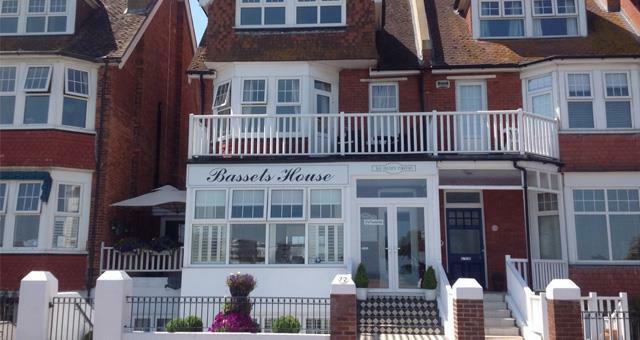 Excellent seafront location with fabulous views to the sea and the South Downs. All our double, twin beds& family rooms are en suite and some rooms have balconies. All rooms have double glazing, colour TV and hospitality trays. Free unrestricted public street parking available, including disabled bays opposite. Safe lock-up for bicycles. Check-in time 3.00 pm to 7.00 pm, check-out time 11.00am. Times can be flexible if agreed in advance. No pets please and strictly none- smoking throughout the house, Children aged between 3 and 18 years are very welcome but sorry, we have no facilities for tiny babies, so no children under 3 years old please. Facilities on the seafront opposite Basset's Hotel - bowls club, yacht club, angling clubs, Pavilion Restaurant & Tea Rooms, Treasure Island, Redoubt Fortress. Close to the town centre, theatres, restaurants, the Pier and Sovereign Centre, all within easy walking distance. Children welcome from age 3. A well located and appointed Guest House run by a very friendly couple for whom nothing was too much trouble. Excellent breakfast in a breakfast / sitting room overlooking the promenade / sea. Really couldn't have asked for any better for the competitive price. Follow signs to the sea-front. Bassets is on Royal Parade directly opposite the Redoubt Fortress. 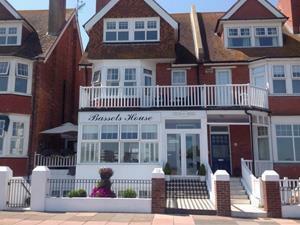 Regular trains run from London Victoria, it's then a short taxi ride from Eastbourne station to Bassets House. National Express and other Coach services run regularly to Eastbourne from all over the UK.